I designed this blanket while on my honeymoon in Hawaii. I loved watching the waves come in, and wanted to capture the feeling of the ocean so that I could snuggle up with a blanket and dream of Hawaii on cold winter days. My husband even drove me to a yarn shop in Hawaii so that I could buy new yarn to start knitting it right away! 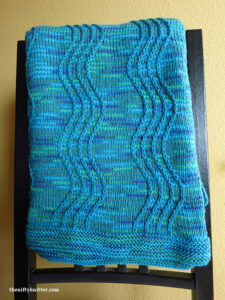 The blanket is constructed using mini cables and two colors of yarn. Similar colors will blend into each other and create a variegated look, while different colors will show more pronounced striping. 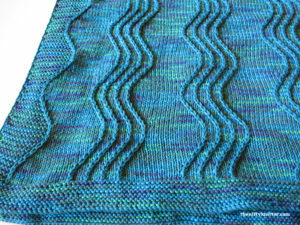 Optionally, the blanket can be knit with just a single color of yarn instead. 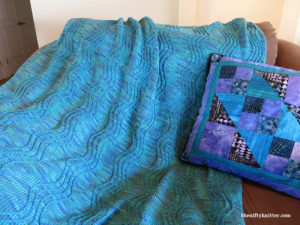 The finished size of the blanket is 58 inches by 52 inches (147 cm by 132 cm). 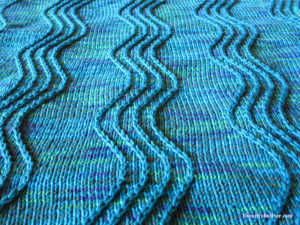 The size can easily be modified by casting on more or fewer stitches and working more or fewer repeats of the chart. Size 9 US (5.5 mm) needles. Approximately 1200-1300 yards of worsted weight yarn for main color. Approximately 1000-1100 yards of worsted weight yarn for contrast color. Cable needle (or anything that can hold a single stitch at a time).